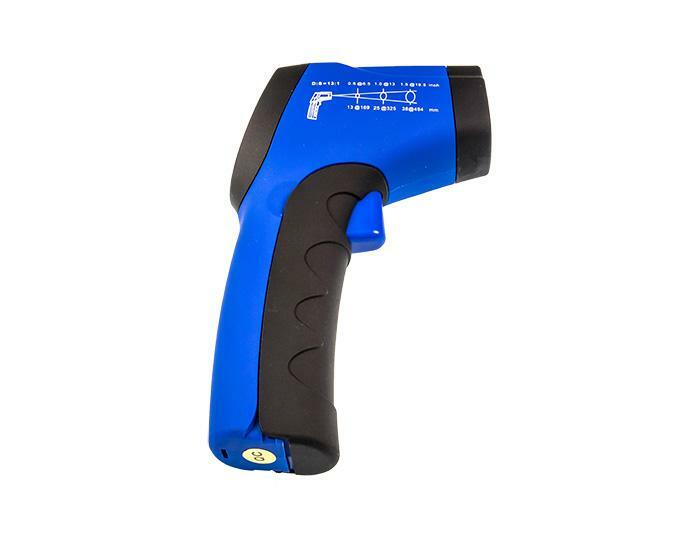 This semi-professional Infrared Thermometer gun with integrated laser pointer can be of great use for several different applications. You can use this thermometer when you're trying to take any airlocks out of a coolant system. Following the hoses with the laser pointer will reveal any air by showing a temperature difference. The thermometer can also be of great use to find out if and where you have a brake problem. Simply scan the surfance of the disc from in to out and you'll see if there's big temperature differences which can indicate problems. Another application which is very common is tyre temperature measurement. Simply scan the tyre and you'll see the temperature differences. The measurement range of this device is -50°C - +350°C with a tolerance of ±2°C. You can select it to read °C or °F. Once you've got this thermometer, you will discover more and more applications. A real must have the home mechanic!